Have you found an online vendor selling Bajan Estate XO? Brought back to Oz from my trip back to the UK , along with 5 other rums you cant buy here. The info on the bottle sounds alot like Plantation 20 XO so for a measly 20 quid on special at Marks & Sparks it was worth a go..
Definitely more astrigent upon opening so I left it in the glass for a good 15 mins. Eventually I found the fruity aroma of the Plantation and even the toasted coconut.. It sipped ok but an ice cube helped mellow this youngish ? spirit. Bit of a bite and the caramel and sugar on the label was duly noted ! Overall a very good rum but a bit short on the "original"
If living in the UK buy yourself a bottle , great taste , great value. This house brand of the premium supermarket Marks & Spencer caught my eye as the shelf label mentioned C. Ferrand. Could this be a house brand version of the lovely Plantation XO? I had to find out. Details are vague on the origin of this rum. Some make reference that this is from Foursquare (always good). Others mentions that this is Plantation Barbados 5yo. I happened to have some Plantation XO and the Barbados 5yo (although both had been open for a few months) left so a tasting session was in order. Having poured a dram of each the M&S & Plantation XO are almost identical in colouring. So good old caramel colouring which the label on the M&S does make mention of as well as sugar as an ingredient (thumbs up there although no mention of the amount) . The Barbados 5yo is slightly lighter in colour to the other two. Further similarity pretty much ends here. The aroma of the M&S XO is a bit closer to the Plantation XO than 5yo but is definitely sweeter. Notes of sweet vanilla, caramel but overall lacks complexity. Taste compares similarly to the aroma with sweet, some spice and strong oak but overall does disappear quickly though. “Luckily” (or not) it doesn’t come near the Plantation XO (but this is more than twice the price) in both flavour & aroma nevertheless for the price point this is an excellent supermarket branded rum which is great as both a sipper and mixer. Would I buy it again… probably not as for a few quid more you are in the realms of RL Seale 10 yr old. From the nose and the fact it’s from M&S I’d guess this rum is produced by Plantation. It’s nicely sweet, has a mouth of caramel and orange and is reasonably smooth. More than good enough to sip. I have got nearly only good things to say about his rum, so let's get the one slight negative over with quickly....it's maybe just slightly too sweet. I believe that there is roughly 20g of sugar in it. 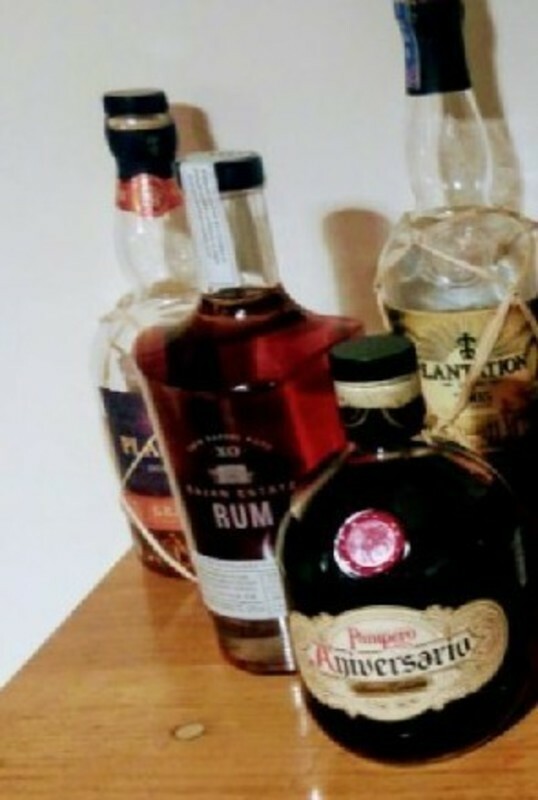 I haven't got an issue with adding sugar (or caramel or anything else for that matter) as long as the bottlers tell us on the label - rum has a very long history of having things added to it and often for the better. Like beer, rather than whisky, it thrives on huge rather than middling or small variation. Halleluljah for that! I love the smell of this, the taste, aftertaste etc, but after I get past sipping around 3 or 4cl, I feel myself thinking, "hmm, it's getting just a little bit syruppy now. I wish it has only 15g of sugar." The sweetness suits it, but personally a little less would be even better. What more do you want - go grab a bottle! Finally, is it as good as somehting £10-15 more expensive? No....not if you buy wisely. It hasn't got the complexity of something like El Dorado 12. But for the price, this is great. At £22 for a bottle you're getting a great sipping rum! Notes of banana & vanilla are pleasantly present along with that Barbados "essense" but a bit on the liqueur side! Give it a try, you won't be disappointed. Barbados never disappoints for rum. Kudos to Marks & Spencer’s for stocking this. Great mixer, good sipper. What a star purchase, was online purchasing the M&S 10yr Guyanese single estate and this was on special at under £20 yes less than £20 a bottle and it's worth so much more. Read the other reviews and glad I did as and I have to agree it's is really good value. Yes it had added sugar and colour, which it states on the label, it's honest but equally bloody good. Smooth, rich, lovely nose, stands on its own against rums that are £10 plus more expensive. Fine (even good) as a sipping rum, but fab as a mixing rum with ginger ale and a slice of lime. Buy a bottle take a chance, I usually prefer sweet notes on my rums (El Dorado, Abuelo, Pampero, Plantation etc) and this one is much of that ilk. Am now off to see if its still on special, if not still only £24 a bottle. It tastes great on its own. Smooth and kinda sweet. For a "supermarket rum" this has to be by far the best I have found so far. Vanilla, caramel and so easy to drink. It's very light colour tells you it's not going to be overly sweet. If anyone can recommend a "better supermarket rum", then please do. All in all a great rum for the price. This is on of the two Marks & Spencer re-badged Plantation rums. As such, it is very untypical of Bajan rum, as it is very sweet - nothing like a Doorley's XO or a Mount Gay XO. Solid bottle, reasonable looking label, functional screw cap. Full aroma, dominated by molasses and vanilla. Compared to the M&S Guatemalan "Cana Negra" it is a tad sweeter, but has a much stronger flavour of vanilla, with a smooth finish. The dominant vanilla note is not quite as strong as that of the Diplomatico Reserva Exclusiva (in Germany Botucal Reserva Exclusiva, apparently due to a copyright fight with Aldi), which rates quite highly on this site. I find the Diplomatico overpowering and the Bajan Estate XO borderline. If you like the former you'll be good with this. However at the price (2016: £ 24.-) it is one of the cheapest aged rums in the UK and definitely a bargain. This rum is very easy to drink on it's own. It's got a very smooth taste. I find the aroma of this rum misleading as it smells very dull. Upon tasting however it explodes in the mouth with an initial sweet vanilla and caramel hit. The rum then makes the tongue and tonsils tingle before leaving you with a warm liquorice after taste. I'm not an expert but the flavours in rums always seem better when sipped neat and at room temp rather than over ice which can make the rum rather harsh. Love this and the price is very reasonable. In a different bottle for M&S. The bottling of this rum makes you question it's worth as it is nothing special. When you pour this into your glass it smells sweet and tropical. This rum has a good nose it invites you yo smell it. When sipping it you're greeted with a sweet carmel like taste. You can taste the subtle oak taste but the sweetness has a nice balance. This rum can be enjoyed best straight with out ice. It will have cognac lovers questioning if it is a cognac but it is a rum and a damn good one too. I have jusy finished my bottle I may get another bottle or two and keep them in stock as this is a good rum forits price. This is one of Marks & Spencer's own branded rums. Purportedly from Foursquare and "twin barrel aged" in France by Plantation (it is referred to on the back label as Caribbean Plantation Rum and the till receipt mentions Cognac Ferrand). 40% alc. with listed ingredients as Barbados Dark Rum, Cane Sugar, Colour: plain caramel. The criticism is that there is too much cane sugar/caramel and that it might be a little too one dimensional with vanillin notes dominating. BUT, to me that (the sugar/caramel) is a big plus as it makes it so easy to drink. While many Bajan rums can be dry and not overtly fruity, this is very much different. The dryness is there, but the caramel and oak give weight and sweetness. It might be imagination, but there are cognac notes that add to the complexity. Very good everyday rum - well worth a try although some might find there too many vanilla notes. A crowd pleaser to be sure and that leads to the other criticism in that it is too easy to drink. I did re-rate this as I found the addition of the sugar made it too sweet. But not having had a bottle for a couple of months, I rather missed it. Got another bottle today, and while it is sweet - too sweet - it has a certain appeal to it. While I find something like Pyrat XO an affront to rum because it is akin to an orange liqueur, I am being inconsistent in rating this highly. It is like a 40% Bailey's with rum rather than whiskey. It is so easy to drink that I want to give it an 8, but I know that the addition of sugar takes that little gloss off of it. Would love to taste one with a wee bit less sugar. But damn, I buy a bottle and it's empty before you know it, and that really is the ultimate test.